The ZWO ASI290MM comes with a back-illuminated, 6.46mm diagonal size (type 1/2.8") Square Pixel Array Monochrome CMOS Image Sensor with IMPROVED VISIBLE LIGHT and NEAR INFRARED SENSITIVITY that supports 1080p. Sony has developed the approx. 2.13M effective pixel back-illuminated CMOS image sensors IMX290LQR and IMX291LQR with improved sensitivity in the visible-light and near infrared light regions for industrial applications. A new 2.9 µm-square unit pixel has been developed that combines a back-illuminated structure with technology for improving near infrared sensitivity to further enhance picture quality at low illumination while at the same time realizing Full HD cameras for industrial applications. This realizes two or more times the sensitivity in the visible-light region and three or more times the sensitivity in the near infrared light region than that of the existing Sony product (IMX236LQJ). The result is extremely low read noise, an amazing 1e at 30dB gain and high sensitivity especially in the near IR range. The characteristics of this camera suggest that with its very high sensitivity, low noise, small pixel sizes, comparatively high resolution and very high framerate this camera might become our lead planetary imager. It is not meant to compete with an ASI174, ASI178 or ASI185 as those are more suited for a more versatile task when imaging larger objects; i.e. the ASI174 is excellent for imaging the Sun, the Moon and other larger objects or well suited for planets when used with very large telescopes, however the ASI290 will work very well with smaller telescopes when imaging really tiny objects like Jupiter, Saturn, Mars, Venus, etc or maybe even small DSOs. The ASI290MM camera comes with USB3.0 connection that gives you the opportunity to use it with newer laptops and is backward compatible with USB2.0. High framerates are not a guarantee for excellent images, but certainly helpful if other circumstances are given and especially helpful for the weather conditions of the average UK sky. There is no USB 2.0 version of this camera as that simply won't be enough to use the camera's possible high framerate, plus, for the same reason, we would really recommend to use it with USB3.0 compatible hardware as that's the only way to achieve very high framerates...Never-the-less it is backward compatible with USB2.0 computers where a lower framerate can be achieved. Due to the high IR sensitivity and the various ways that this camera can be used, IR cut-off fiter is not built in so we would also recommend to buy it separately as well. 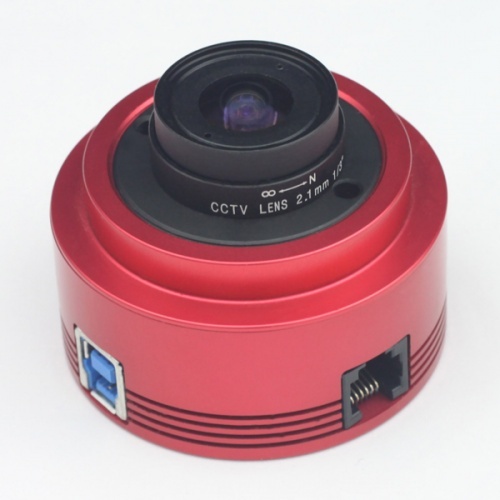 It comes with an AUTOGUIDER PORT just as many other ZWO cameras, so when you don't use it for imaging, you may use it for guiding in combination with another deep sky imaging camera! This camera will mostly be used for imaging planets, but it can also be used for imaging small deep sky objects up to a certain level as it supports up to 2000 seconds exposure time. Long time exposure up to 2000s!